If you own a firearm chambered in the handy .22 TCM cartridge, why not be prepared to use it in self-defense if the need arises? 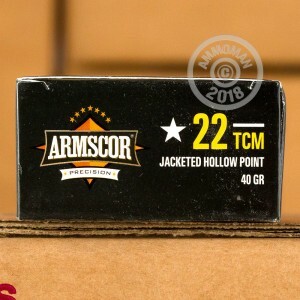 These jacketed hollow point cartridges from Armscor fire a 40 grain projectile at 1,875 feet per second, taking advantage of the high velocity potential of the .22 TCM to deliver excellent expansion and stopping power. Like all .22 TCM ammo currently available, this ammunition is manufactured by Armscor using non-corrosive Boxer primers and brass cases. 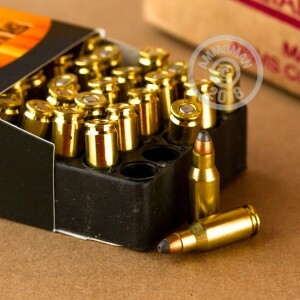 This is a fun cartridge to shoot, and you might not be able to stop at 50--grab a few boxes (or any items over $99) from AmmoMan.com to get free shipping!